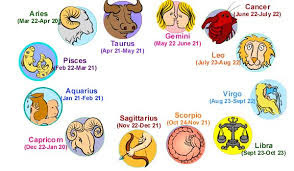 There are 12 different horoscope signs, also known as Astrology signs or Zodiac Signs. Depending on the day and month of your birth, your zodiac signs will be determined. These horoscope signs are useful to determine a lot of information about the individuals like their likes, dislikes, taste, preferences, talents, career, health, love and marriage compatibility etc. The twelve different signs can be broadly categorized into masculine and feminine, positive and negative and active or passive. A Masculine sign is a sigh that is more active but less receptive. They are usually the Air and Fire signs. The feminine sign is more receptive and less active and they are the earth and water signs. Aries, Gemini, Leo, Libra, Sagittarius and Aquarius are the masculine signs and the remaining, that is Taurus, Cancer, Virgo, Scorpio, Capricorn and Pisces are the feminine signs. The information provided by Zodiac signs and horoscope signs can be easily interpreted and understood and can be used for various purposes. They are very common and highly popular. Horoscope Signs are the reason why people have different characteristics and personalities. It is the reason why their taste, choices, preference vary in terms of career, love, marriage etc. One will be surprised to find out the extent to which it can match. It will also help you to understand yourself more deeply and better. It will make things simpler by providing explanation to a lot of things happening around us.